valentine’s day week means chocolate finds its way into breakfast everyday. this is a not-so-subtle way of getting your chocolate fix in. i’m all for chocolate in the morning because it means you have all day to burn calories! 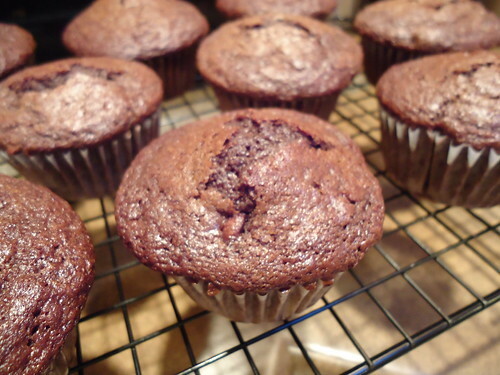 line a muffin tin with 12 paper cups. spray lightly with cooking spray. pre-heat oven to 425º. 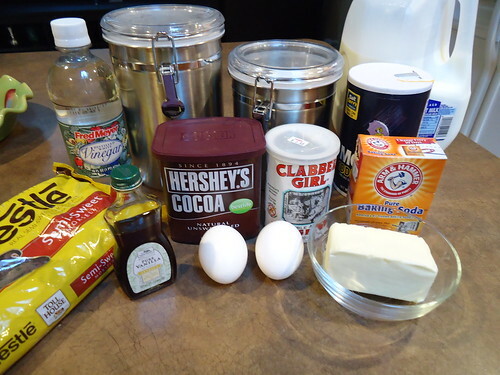 in a large bowl, whisk together flour, cocoa, sugar, baking powder, baking soda, salt and chocolate chips. in a separate bowl, whisk the eggs, milk, vanilla and vinegar until blended. stir in the butter. add the wet ingredients to the dry ingredients. stir with a rubber spatula, just until blended. divide evenly between prepared muffin liners. the cups will be full. bake for 20 min. until the muffins bounce back when pressed with a finger. cool on a wire racks for 5 minutes.